“If it was up to me, personally, yeah, I would give him a rematch,” Usman said on The Ariel Helwani MMA Show. “I mean, Tyron, I believe has been an exceptional champion…a great guy, great dude…nothing but love and respect for Tyron. This is all business. I just couldn’t sit way back in the shadows and let this other clown run his mouth and talk himself in and out of the title fight. And so it was my time. That was my time to go out there and do what I do, and I did. 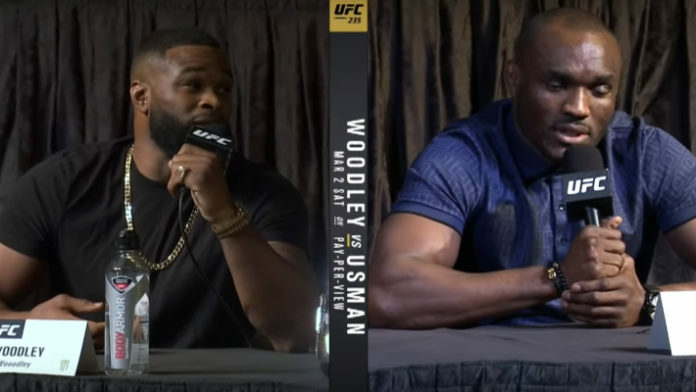 Tyron Woodley was instantly on board with the rematch as well, but Dana White has appointed Colby Covington as the first challenger to Kamaru Usman’s championship, and this interview from Usman indicates that Usman is powerless to shift those plans. Whom do you believe should face Kamaru Usman next? Colby Covington or Tyron Woodley?